Sloped seats, a curved back, and easy in-and-out swivel movement make it is to add comfort to any outdoor area with our Poly Swivel Balcony Chairs. 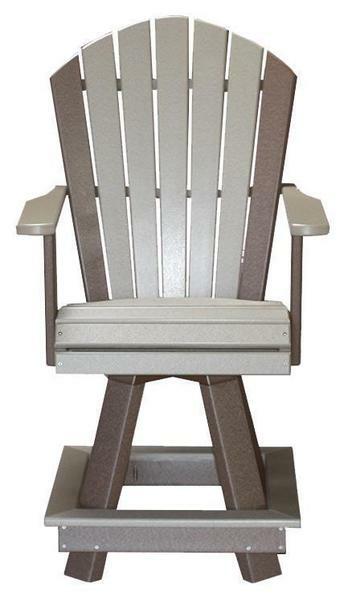 Crafted by hand, these Adirondack style pub chairs can be placed with a poly balcony table, or arranged together for a unique sitting area in any outdoor space - ensuring that everyone has a place to relax during your get together or quiet time outside. The modern Poly material is a step above traditional outdoor furniture, offering a maintenance-free solution to outdoor living. You can move past the days of sand paper and wood sealer and start spending more time enjoying your space. Each chair offers a rich, vibrant color that is present through the entire piece, ensuring a fade-resistant, weather-resistant look that is ready for life outdoors. This unique poly lumber will also remain chip-free, crack-free, and splinter-free to ensure many years of continued enjoyment. Choose from a multitude of colors, solid or two-tone, for your new poly Swivel Balcony Chairs and get back to doing what you love to do - spending time enjoying good company and all of the beauty that nature has to offer.